On Thursday, The Post & Email learned that two U.S. Senators, Mitch McConnell of Kentucky and Orrin Hatch of Utah, requested Sheriff’s Kits produced by Michael Volin of WheresObamasBirthCertificate.com (WOBC) with the purpose of informing the public and elected officials of the forgery of the long-form birth certificate image posted since April 27, 2011 on the White House website. The kits contain a presentation given by Maricopa County, AZ Cold Case Posse lead investigator Michael Zullo, who details the findings of an investigation begun in September 2011 into claims that the birth certificate was a forgery. The investigation has since broadened its scope and earlier this month reportedly yielded “universe-shattering new information” which may be made public in March. Sheriff’s Kits can be downloaded for electronic distribution or ordered in DVD format. On December 16, Volin issued a challenge to Congress and the White House to release the “original Obama birth certificate for inspection” by the Cold Case Posse and the American people. Volin contacted The Post & Email early on Thursday to provide the latest update. The posse also investigated the Selective Service registration form which has been sent by the Selective Service System (SSS) to members of the public who have requested it and found it to be fraudulent. 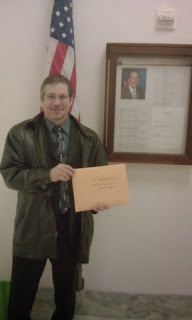 On November 18 and 19, 2013, Volin and a group of team members visited numerous congressional offices in Washington, DC to distribute the kits and discuss the findings of the posse. Following the trip, Volin informed The Post & Email that approximately 200 kits were distributed to members of Congress, with another 100 given out at a rally held by Atty. Larry Klayman on November 19 to protest Obama’s policies, perceived overreach of power, and questionable constitutional eligibility. Volin told us that after the two senators’ offices made the requests for the kits, he “decided to make it a personal delivery service.” Volin said that Mr. David Small agreed to make a return trip to Washington, having been part of the original trip in November. “David personally delivered them,” Volin said. Neither McConnell nor Hatch had previously received a kit. Both are running for re-election in 2014. Small returned to Washington with a traveling companion on December 4 and spent the afternoon delivering the kits, including two additional, unplanned stops which he detailed to The Post & Email. A friend and I went to Orrin Hatch and Mitch McConnell’s offices. Neither of them was in. I wasn’t able to speak to staffers other than receptionists in those two offices and I simply dropped off the kits with the receptionists. I attempted to relate a little bit of the information in the kit to the receptionists. The receptionist in Mitch McConnell’s office couldn’t have cared less. The receptionist in Orrin Hatch’s office, however, was very attentive, and I have a very good feeling that he would have at least given it to a staffer with some information about what was enclosed. Trey Gowdy is a member of that subcommittee. I spoke to the receptionist and showed her the packet. She asked me to sit down and wait for a few minutes so that she could get someone to come and speak with us. She did. The individual who came and spoke to us was Caroline G. Lynch, Chief Counsel of the Subcommittee on Crime, Terrorism and Homeland Security. I explained to Ms. Lynch that we were here dropping off information related to the investigation done by Sheriff Joe Arpaio and the Cold Case Posse. She pretty quickly told me that they were going to have nothing to do in her office with “eligibility.” I told her, “This isn’t about eligibility at all; it’s about the birth certificate and a crime around that.” She very quickly stopped me again and said, “If you want to report a crime, we don’t investigate crimes in this office; that needs to be done through the FBI.” It was all very, very quick and plain to me that she was indicating that her office was not going to do anything around this issue, no matter what. I told her that I was sure the FBI has been contacted multiple times regarding the matter. I told her that we were meeting with people who directed us to Mr. Goodlatte’s office, which then directed us to her, and that we had information that we would like to run by her committee, and “Can I give you this packet?” Again, we went round and round several times about “eligibility” and reporting a crime, and she made it clear that “This office does not investigate crimes.” I made it clear that we were there with the blessing of the Maricopa County Sheriff’s Office and that we really wanted to deliver the packet to her. Finally, she agreed to take the information, walked away with it, and we parted company. I have no idea what’s been done with the information, but Caroline G. Lynch, Chief Counsel of the Subcommittee on Crime, Terrorism and Homeland Security, was presented with that packet. She wouldn’t allow any pictures to be taken in the office, but I have a picture of myself right outside the door of the office. Q: Did you get the idea that Ms. Lynch was familiar with the eligibility issue? A: Yes, absolutely from her responses, she was indicating that she was aware that there was a question around eligibility and that her office would have nothing to do with it. I can’t read her mind, but I would be surprised if she didn’t know a certain amount about the issue. She was very steadfast that her office was going to have nothing to do with it, no matter what. Q: Do you think she had heard about the forgery? A: I can’t answer that; she did not indicate that she was aware of it at all. Q: Have you planned any type of follow-up? A: There is nothing firm planned yet, although I definitely want to do some follow-up around this. I think it would be great to contact Rep. Goodlatte and Rep. Trey Gowdy, as I dropped off a packet at the Judiciary Committee as well.